(Nanowerk News) Berkeley Lab researchers have developed a nano-sized optical antenna that can greatly enhance the spontaneous emission of light from atoms, molecules and semiconductor quantum dots. This advance opens the door to light-emitting diodes (LEDs) that can replace lasers for short-range optical communications, including optical interconnects for microchips, plus a host of other potential applications. Yablonovitch, who also holds a faculty appointment with the University of California (UC) Berkeley where he directs the NSF Center for Energy Efficient Electronics Science (E3S), and is a member of the Kavli Energy NanoSciences Institute at Berkeley (Kavli ENSI), led a team that used an external antenna made from gold to effectively boost the spontaneous light emission of a nanorod made from Indium Gallium Arsenide Phosphide (InGaAsP) by 115 times. This is approaching the 200-fold increase that is considered the landmark in speed difference between stimulated and spontaneous emissions. When a 200-fold increase is reached, spontaneous emission rates will exceed those of stimulated emissions. 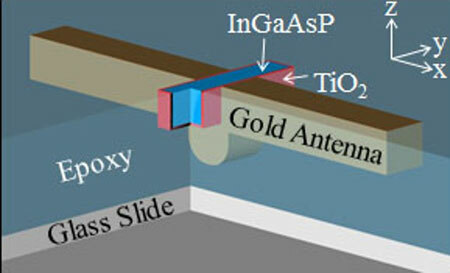 Coupling a gold antenna to a InGaAsP nanorod, isolated by TiO2 and embedded in epoxy, greatly enhanced the spontaneous light emission of the InGaAsP. The results of this study are reported in the Proceedings of the National Academy of Sciences (PNAS) in a paper titled "Optical antenna enhanced spontaneous emission". Yablonovitch and UC Berkeley’s Ming Wua are the corresponding authors. Co-authors are Michael Eggleston, Kevin Messer and Liming Zhang. In the world of high technology lasers are ubiquitous, the reigning workhorse for high-speed optical communications. Lasers, however, have downsides for communications over short distances, i.e., one meter or less – they consume too much power and typically take up too much space. LEDs would be a much more efficient alternative but have been limited by their spontaneous emission rates. For their optical antenna, Yablonovitch and his colleagues used an arch antenna configuration. The surface of a square-shaped InGaAsP nanorod was coated with a layer of titanium dioxide to provide isolation between the nanorod and a gold wire that was deposited perpendicularly over the nanorod to create the antenna. The InGaAsP semiconductor that served as the spontaneous light-emitting material is a material already in wide use for infrared laser communication and photo-detectors. In addition to short distance communication applications, LEDs equipped with optical antennas could also find important use in photodetectors. Optical antennas could also be applied to imaging, bio-sensing and data storage applications.